There are 15 slides (but only 13 different activities). Read below for the details of each slide. • 2 slides to introduce the terms fiction and nonfiction. These are not interactive and are more of an anchor chart. • 2 slides to review reality and fantasy. Students will sort 10 different book titles into the correct category. 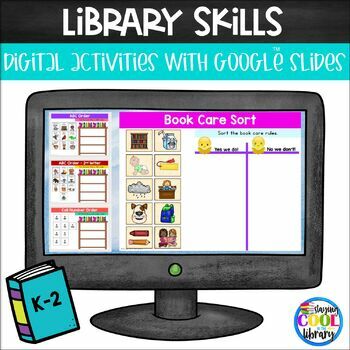 • 1 slide to review fiction and nonfiction book titles. Students will sort 10 different pictures into the correct category. 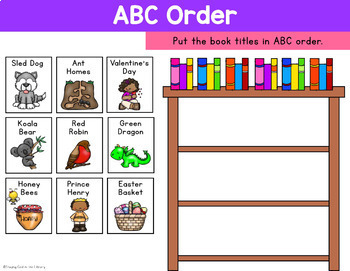 • 2 slides to put book titles in ABC order. One to the first letter and one to the second letter. • 1 slide to put fiction call numbers in ABC order. (One slide has call numbers with E/2 letters of the author's last name and one slide has call numbers with E/3 letters of the author's last name. Use the slide that fits your library. If there is a different call number you use for fiction books send me an email and I will try to make a slide for you. • 2 slides to label the parts of a book (cover, author, spine, title). One for a fiction book and one for a nonfiction book. • 1 slide to label the parts of a book (title, spine, barcode, illustrator, front cover, back cover, call number, author.) There is one slide with a call number "E BU" and one slide with a call number "E BUR". Again, send me an email if you need something different. • 2 slides to sort book care rules. One slide has just pictures and one slide has simple sentences. The preview shows every slide. Please download it before purchasing. Important Note: This is not an editable resource. The background of each slide cannot be changed. However, you can delete any of the movable images/words if you would like and use your own. Each slide has movable pieces. These slides are very similar to a few of the printables available in my Library Noprep Printables.